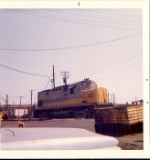 Description: LV C420 #415 at D&H Oneonta yd. Description: Don't try this either - pacing shot along Gulf Rd. I'm gaining on them trying to get to the Gulf Rd. crossing before they do. LV 413 doesn't look too healthy - note the stain over the "VA" of VALLEY.